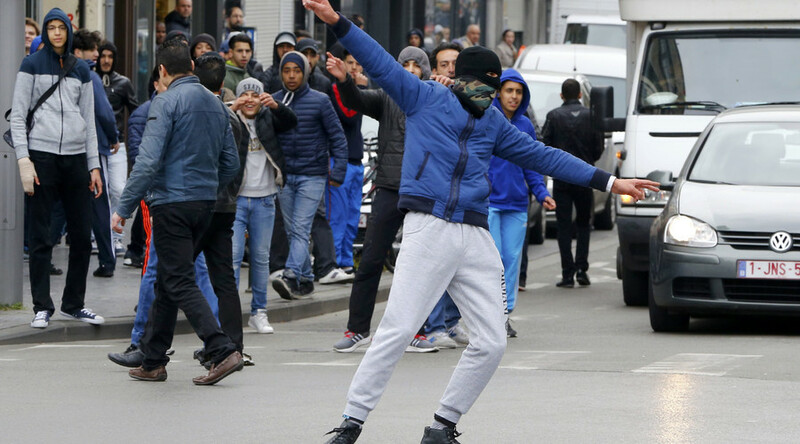 Police were forced to separate anti-Islamic demonstrators and Muslim youths in the notorious Brussels district of Molenbeek, home of the organizers of last week’s airport and metro attacks, as the entire Belgian capital was rocked by unsanctioned protests. Amid security concerns about repeat acts of terror, and following volatile demonstrations last weekend, all political gatherings were banned by the Brussels regional administration for Saturday. 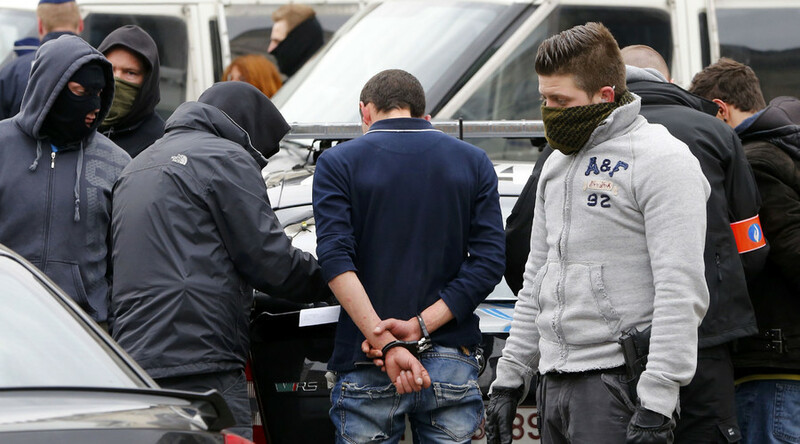 But up to 400 right-wing activists, many of them members of football fan groups, gathered in a Brussels suburb before marching towards Molenbeek, where about 40 percent of the population are Muslim. As the group, under a banner proclaiming “This is our country!” arrived, they began shouting anti-Islamic and anti-immigrant slogans, as shopkeepers began to shutter their stores. Police quickly intervened to separate the sides, with over 200 officers arriving in riot vans, full combat gear, and on horseback as a police helicopter circled overhead. The counter-protesters began to push back the uniformed officials, with one man caught lobbing garbage at the riot police. Two suspected right-wingers carrying Molotov cocktails were detained near the site of the demonstration, and dozens more were bundled into police vans. At one point a car accelerated into a police cordon, prompting several plain-clothes officers to pull out their weapons and point them at the drivers, who were filming the scene on a mobile phone. As the white hatchback pulled away, it hit a Muslim woman, before accelerating away. Local media reported that the driver of the car, whose number could be clearly seen in media images, was a resident of Molenbeek. 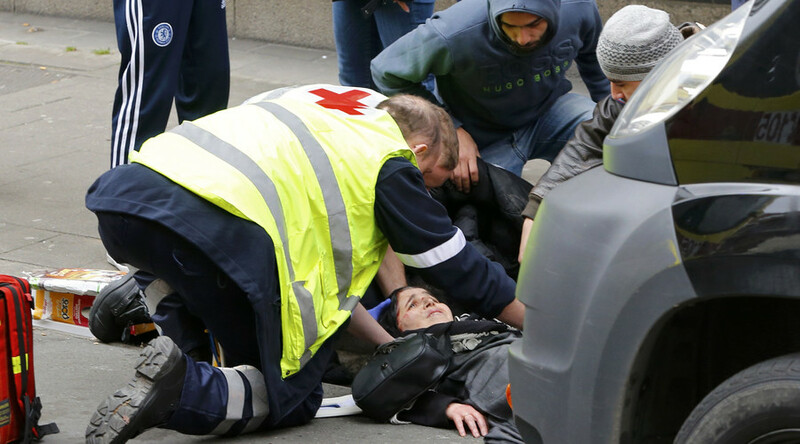 A separate spate of arrests occurred in the Bourse square in the heart of the city, which has become a memorial to the victims of the March 22 attacks, which killed 35 people, and left more than 350 with injuries. There a group of two dozen anti-fascist protesters began to chant and sing, in condemnation of the right-wingers who were there before. They were peacefully but forcefully removed from the square. “We should not fall into hatred, not give in to terror and not give in to fascists,” one of the participants told AP. The situation had calmed down by sundown, with fewer than 20 out of more than a hundred who were arrested remaining in police detention overnight.